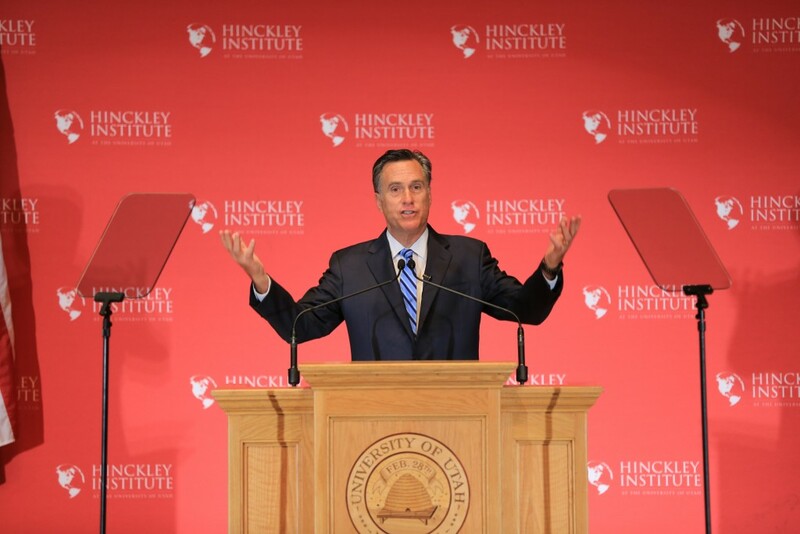 Alarmed by Donald Trump’s growing momentum, Mitt Romney delivered a “State of the 2016 President Election” speech Thursday to a turn-away audience, many of whom had been waiting for three hours, at the Hinckley Institute of the University of Utah. That the senior statesman of the Republican party should use his influence to deflate the front-running candidate indicates just how serious and even catastrophic the prospect of a Trump candidacy is to many Republicans. A #NeverTrump movement has materialized that has only been galvanized after Trump’s Super Tuesday victories with urgent efforts to stop him led by corporate executives, financiers and Republican strategists. Bloomberg columnist Megan McArdle issue an open call to her readers, inviting lifelong Republicans who were so revolted at the possibility of a Trump nomination to weigh in. She was overwhelmed with responses, most of them passionate. This is the context in which to understand Romney’s speech where he calls Trump a “fraud” and a “phony” and warns that this is “a time of choice” for both the future of the Republican party and even more important, the future of America. He neither announced his candidacy, nor endorsed a candidate, but came to warn. His critiques were both on Trump’s character and policy. “I am far from the first to conclude that Donald Trump lacks the temperament to be president. After all, this is an individual who mocked a disabled reporter, who attributed a reporter’s questions to her menstrual cycle, who mocked a brilliant rival who happened to be a woman due to her appearance, who bragged about his marital affairs, and who laces his public speeches with vulgarity. “Donald Trump says he admires Vladimir Putin, while he has called George W. Bush a liar. That is a twisted example of evil trumping good. There is a dark irony in his boasts of his sexual exploits during the Vietnam War while John McCain, whom he has mocked, was imprisoned and tortured. “Dishonesty is Trump’s hallmark: He claimed that he had spoken clearly and boldly against going into Iraq. Wrong, he spoke in favor of invading Iraq. He said he saw thousands of Muslims in New Jersey celebrating 9/11. Wrong, he saw no such thing. He imagined it. His is not the temperament of a stable, thoughtful leader. His imagination must not be married to real power. “Think of Donald Trump’s personal qualities, the bullying the greed, the showing off, the misogyny, the absurd third grade theatrics…” When a person in a prominent position acts in this way, what message does that convey to your children and grandchildren? Romney gives examples: “His proposed 35% tariff-like penalties would instigate a trade war that would raise prices for consumers, kill export jobs, and lead entrepreneurs and business to flee America. His tax plan, in combination with his refusal to reform entitlements and to honestly address spending would balloon the deficit and the national debt. “So even as Donald Trump has offered very few specific economic plans, what little he has said is enough to know that he would be very bad for American workers and for American families. “But wait, you say, isn’t he a huge business success that knows what he’s talking about? No, he isn’t. His bankruptcies have crushed small businesses, and the men and women who worked for them. He inherited his business; he didn’t create it. And what ever happened to Trump Airlines? How about Trump University? And then there’s Trump Magazine and Trump Vodka and Trump Steaks, and Trump Mortgage? A business genius he is not. When it comes to national security and the safety of our homes, Trump is also dangerous. Romney said, “Trump’s bombast is already alarming our allies and fueling the enmity of our enemies. Insulting all Muslims will keep many of them from fully engaging with us in the urgent fight against ISIS. And for what purpose? Muslim terrorists would have to lie about their religion to enter the country. Polls are saying the Trump would lose to Hillary Clinton, Romney noted. “A person so untrustworthy and dishonest as Hilary Clinton must not become president. But a Trump nomination enables her victory.” Trump’s radical positions so clearly and often stated will play a hundred thousand times on cable and many million more times on social media. Romney said he knew the anger that Americans feel today, but “in the past, our presidents have channeled that anger, and forged it into resolve, into endurance and high purpose, and into the will to defeat the enemies of freedom. Our anger was transformed into energy directed for good. This tough talk from Romney only mirrors a larger movement. Though he didn’t prescribe any remedies, he did signal that those who are sick at heart about a Trump nomination have good reason to be concerned. The movement to stop him that is beginning to emerge suggests there may be more to do than settle back, complain and wait for the inevitable. As I listened and then read Mitt's remarks, I felt sure that all Christians were thinking that finally, "someone is saying what needs to be said." The warnings needed to be given and I am thankful that Mitt had the courage and wisdom to speak out against Trump's being unpresidential and lack of wisdom and his egotistical blather. He has no plan how to "Make America Great Again". When Trump speaks nearly every sentence or phrase begins with "I" .Trump only wants to make himself great. How dare he brag of his adultery and use fowl language and jokes while running to be President of the United States. I have no doubt that the Pilgrims and Puritans, whose Christian values and ethics we still try to live after 400 years, would have Trump in the stocks for 100 years. I hope that we will all remember the great heritage and wisdom of our forefathers, wherever they came from, to elect good, wise, and knowledgeable men to be our president.